Warm colors and crisp weather! This is the third chart is the Welcome Seasons series. 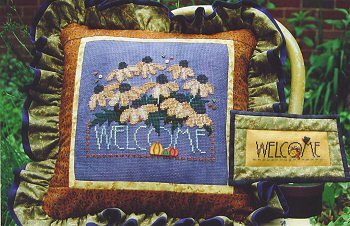 Autumn Welcome is stitched on R&R Reproductions 10 count Blueberry Tula with The Caron Collection Watercolours in Black Forest, Blackwatch, Caramel, Celadon, Pine Forest, Redwood and Spice with JABC pack 5978. Finish is a sewn pillow with ruffle. Black Bird Welcome is stitched on R&R 28 count Harvest Blend using The Gentle Art Avocado, Burnt Orange, Cinnamon, Flax, Gold Leaf, Nutmeg, Royal Purple and Sugarplum. Finish is a sewn banner with bound edge. Vintage chart with photo glued to cover.